The State Department is sticking with a strict no-new-settlements policy toward Israel, its spokesman said Thursday, but he held out the possibility that Israelis and Palestinians might eventually take a different path. “The position that the secretary has stated remains our position,” spokesman P.J. Crowley said at his daily briefing. “And we continue to discuss with Israel and with the other parties what they have to do on the settlement issue.” But he added that, in the end, Israel and the Palestinian Authority would join with others in making such decisions on their way to final negotiations. Earlier this year, Secretary of State Hillary Clinton said she and President Obama had told the Israelis that the United States opposed all expansion of Israeli settlements. 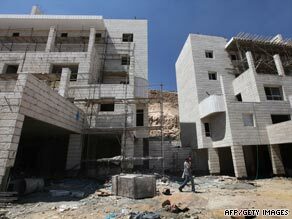 “He [Obama] wants to see a stop to settlements — not some settlements, not outposts, not natural growth exceptions. We think it is in the best interests of the effort that we are engaged in that settlement expansion cease,” Clinton said at the State Department in May, standing beside Ahmed Ali Aboul Gheit, Egypt’s foreign minister. Obama has given Middle East negotiations a high priority, moving in his second day in office to name former U.S. Sen. George Mitchell as a special envoy and dispatch him to the region. Mitchell met this week with Israeli Prime Minister Benjamin Netanyahu in London, and further U.S.-Israeli meetings are expected in the United States next week.